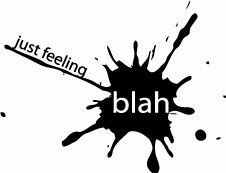 Have you ever felt just BLAH? No motivation. No inspiration. No joy. Just Blah. I HATE when this feeling comes over me. It is hard to shake it off. So I have been feeling blah. Even though I am meditating, exercising, practicing my yoga and kicking and punching a bag at the gym, I am still just blah. Becoming aware of blah moments and trying to see a pattern is important I think and it is something I am trying to become more aware of so maybe I can get ahead of the blah and maybe even break the cycle. So my first question is; What is causing my uninspired feelings and how can I deal with them? If I can answer this I can take action. Most of these recommendations are mental adjustments rather than actual action steps. But they can make a big difference. Take full responsibility for how you feel. Don’t waste your precious time and energy looking for someone or something to blame. No matter what happens we can always choose how to react. This is probably the biggest cause of mental and emotional drain. When you’re not up to doing something, you keep fighting the fog and creating more pain for yourself. Accept the blah as it comes. There is no point fighting it. So when we don’t feel like it, it’s time to look within and see how we can move past it. Here is an idea: instead of fighting the feeling, ask for more. Asking for more means you try and feel all the blah that comes your way. Tell your blah to bring it on, to give you all it’s got. What’s the worst thing that can happen? I bet it won’t take more than a few minutes before you start feeling better. Surrender is very powerful in releasing stuck energy. Talk to your blah and say something like: I know you’re here for a reason, tell me what I can learn from you. You are not a machine and shouldn’t expect yourself t to function at the same level all the time. You will have good and not so good days. We all do. This means accepting your down time as mentioned above. If you have a limitation in a certain area of your life, let it be. Instead of denying or avoiding it, work with it. Accept your limitations without judgment. Ask for help if you need to. For example, if you’re not good with numbers but have to prepare a budget report, ask a colleague to help you or explain the hard stuff to you. People love to help. This is a better choice than staring blankly at your computer screen. Instead of focusing on limitations, open up to the opportunities and resources that can be available to you. To motivate yourself to keep going, you need to be clear about what you want and why you want it. This is one of the best things you can do for yourself. It will give you a sense of direction and ignite your motivation. I’m not talking about rigid goals here. But things that you are passionate about and would love to have more of in your life. Start with a list of things you’d like to be, do and have. From this list you can determine if your choices of actions so far have helped you in moving closer to your desires or if you need to change direction. If you can’t set your priorities straight, someone else will do it for you. You’ll spend most of your time doing what’s important to others, not you. This will overwhelm you even more. Prioritizing is a skill that you get better at with practice. Every day determine what’s the most important task or two. Focus all your energy on getting these done first. You can handle anything else that comes your way after. Pick one thing that nags at you the most. Break it down to simplest actionable portions. Do one action step at a time. Commit to completion. Don’t do anything else unless this task is done. Repeat the above process with the next thing. This may sound overly simplistic but it does work. The most important thing is to choose one thing and eliminate everything else from your stream of thought until you are done. Balancing your important work with life’s unexpected interruptions is an art. Staying flexible means that you allow for things to happen. Don’t over commit or over schedule your time. It’s a recipe for disappointment. As I mentioned above choose the most important task or two, max. This gives you ample time to deal with other things as they come. If you pick two tasks each day, you will complete 10 tasks a week and a whopping 500 tasks a year (assuming you work 50 weeks per year). This is quite an achievement. I haven’t talked about fear in this article. I truly believe that the best way to face your fears is to start shifting your focus and taking action. Most fears, when it comes to moving forward, will be dealt with if you do the above. It’s easy to determine what you can do physically, after dealing with the biggest obstacle—your primitive and protective brain. Consider these ideas as a start and add your own. Just move. Do anything to break the cycle of stagnant thoughts. When you move you improve your circulation and enhance your mood. Then your thought pattern starts to change. And you feel better. These are simple ideas that won’t take much of your time. Walk up and down a couple of flights of stairs. Go outside for a walk. Five or 10 minutes will do. Get a glass of water and drink it slowly. Stretch. A bit of flexibility goes a long way and can ease your physical pain. We all know we should eat healthy but how often do we do it? If you determine that your diet causes you to be more sluggish, change what you eat gradually. Your goal is to eat healthy 80% of the time and you can do what you like with the remaining 20%. This means cutting down on meat consumption, fried foods and sugar. Eat more whole grains and vegetables. And drink more water and less toxic beverages like sodas and alcohol. If you’re exhausted you need to take a break and rest for a while instead of wasting more energy trying to force yourself to keep going. Resting means not doing anything that stimulates your mind. Browsing the web or watching TV is not resting. It’s mind numbing. There is a big difference. Resting allows you to wipe the slate clean and energize your mind and body. Numbing your mind robs of you of time and energy. You don’t wipe the slate clean. You add more crap to your psyche which will make you feel worse after. This is something you can do to feel more energized over the long run. You give yourself time to do things that bring you joy. Pleasurable and thrilling activities will give you a high. The rush can be quite intoxicating. But as we all know, for every high there is a low. Going to loud parties, theme parks, alcohol consumption and extreme sports are examples of activities that will give you short lived pleasure. Spend time in nature. Star gaze, garden, watch a sunset, or walk on the beach. Connect with the people you care about the most. Spend time with family and friends. Nothing is more rewarding than a genuine human connection. Work on a hobby or start a new one. Lose yourself in something that brings you joy. You will forget about the troubles of the world and feel a wonderful sense of satisfaction. Joy is more subtle but lasts much longer. You calmly and gently renew your entire being. If your space is a mess, you need to deal with that before you can find your inspiration. De-clutter and rearrange your furniture to make your environment more inviting and suitable to your needs. Make it a habit to sit quietly and do nothing else. Reflect on your days and experiences. If you can’t just sit still and get lost in your thoughts, write them down. Reflection gives you insight into what’s working and what can be improved in your life. After all’s been said and done, the one crucial thing that will make a difference is action. After you have dealt with the underlying reasons behind your unmotivated phase, you need to act. Start, move and make every action count. I hope you find some of the suggestions above useful in moving forward. As you know there is no one definitive solution for any challenge. The key is to consciously choose the actions that suit you and keep going. And regardless of where you are, may you always uncover the hidden gifts of awakening and growth that come from every experience in your life—including blah moments. This entry was posted in Inspiration, Motivation, Nourishment and tagged depression, feeling blah, lack of energy, NAMI. Bookmark the permalink. I’m not in a “blah moment,” but I keep procrastinating. Things that have to get done are NOT.